Good morning! Do I have a treat for you this morning. Angharad and Jason traveled from Canada to celebrate their marriage in Las Vegas and their masculine but romantic wedding embodies all the best of a wedding day. 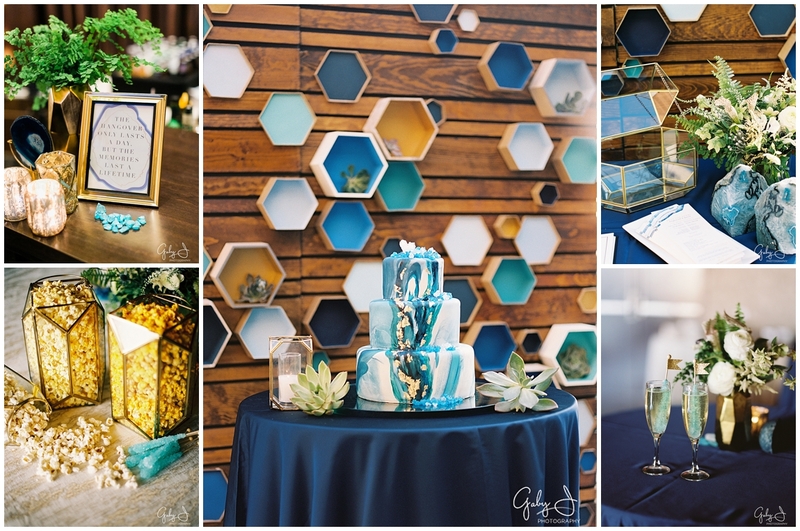 A perfect combination of navy and teal paired with succulents and geodes and topped with one of the most kind and genuine couples you’ll meet. 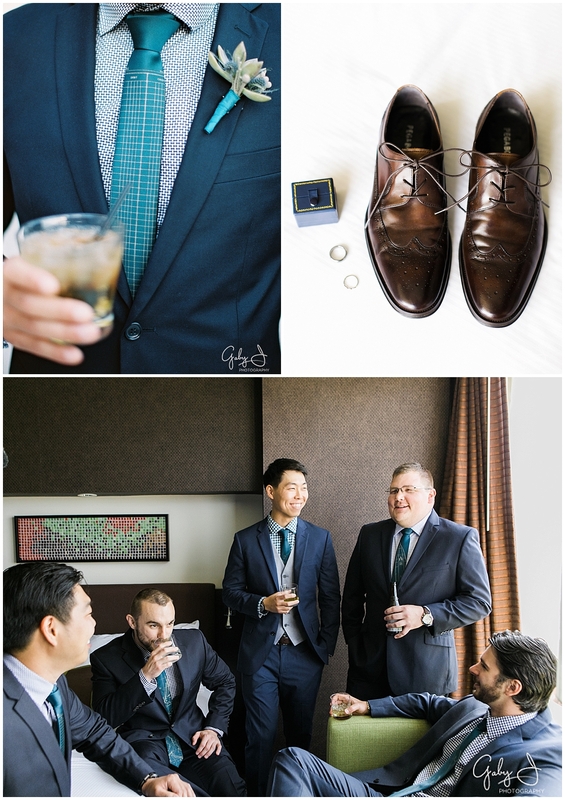 I’m so excited to share their wedding day with you via Gaby J Photography. Angharad and Jason are inquisitive, information collectors, media junkies and life-long learners. Jason is a tech enthusiast. He has a Masters in Planetary Geology and his thesis was on martian meteorites. He dreams of working for NASA. Angharad has a Bachelor of Arts in Comparative Literature and is pursuing further education in Community Engagement and Development. She is a lover of books and loves spending money on Etsy and local craft shows. These happy city-dwellers live in downtown Edmonton, but if they ever win the lottery they will be moving to Paris! Their inspiration for their wedding day was drawn from their interests above, but also from their initial meeting spot of an Irish pub. Their ceremony backdrop created a beautiful scene against the Red Rocks of Nevada. 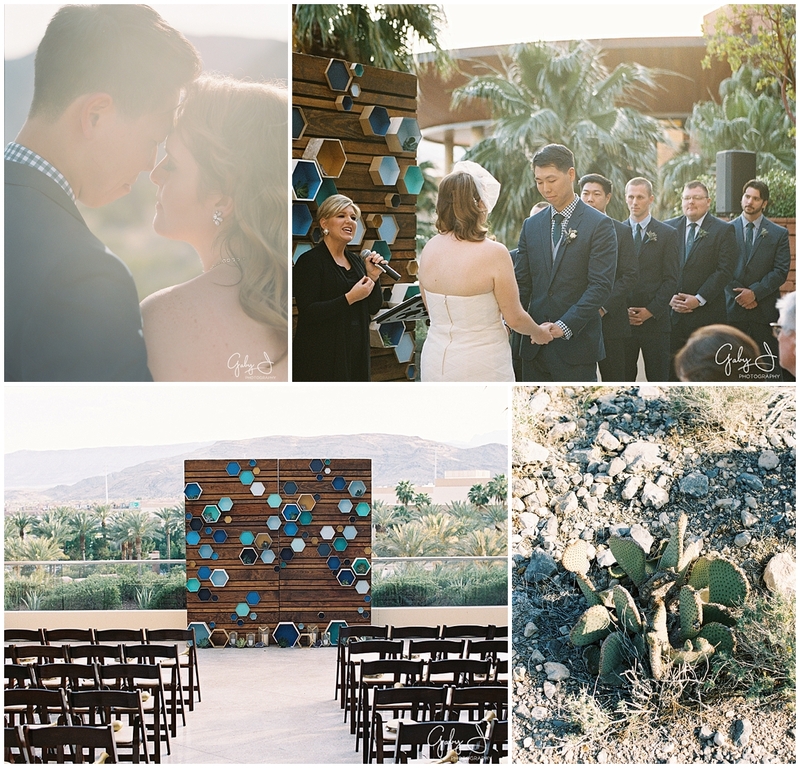 The wood slabs contained hexagon boxes painted multiple colors with succulents perfectly placed. Guests were given gold instruments to make some noise after the grand announcement. Inside, guests were greeted with wooded tables and lush lounge furniture to enjoy pug style cuisine and a great bar, inclusive of champagne garnished with rock candy. 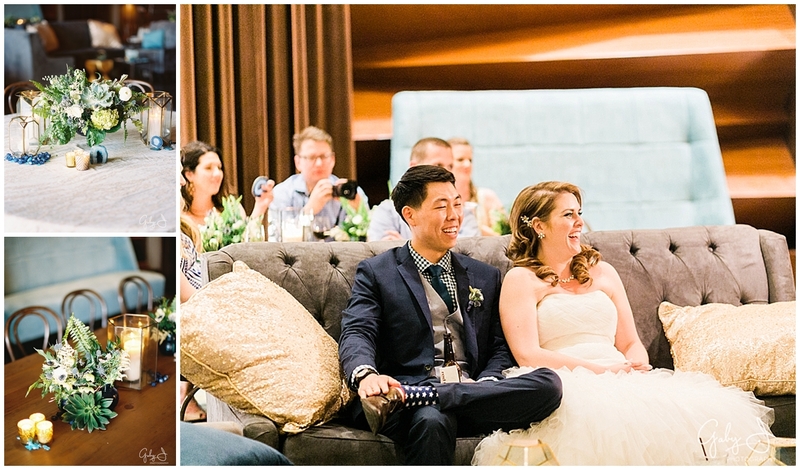 Their informal reception was warm and loving and exactly what they hoped for. Angharad and Jason included Scheme Events on their team because they loved our style and trusted our vision. Angharad gave insight to her wedding day, but ultimately walked into her venue thrilled to see how we took her inspirations to create a wedding day full of their personality and style, including a popcorn bar specifically for them. My heart flutters when my couples are given a day they will cherish and remember for the rest of their lives. 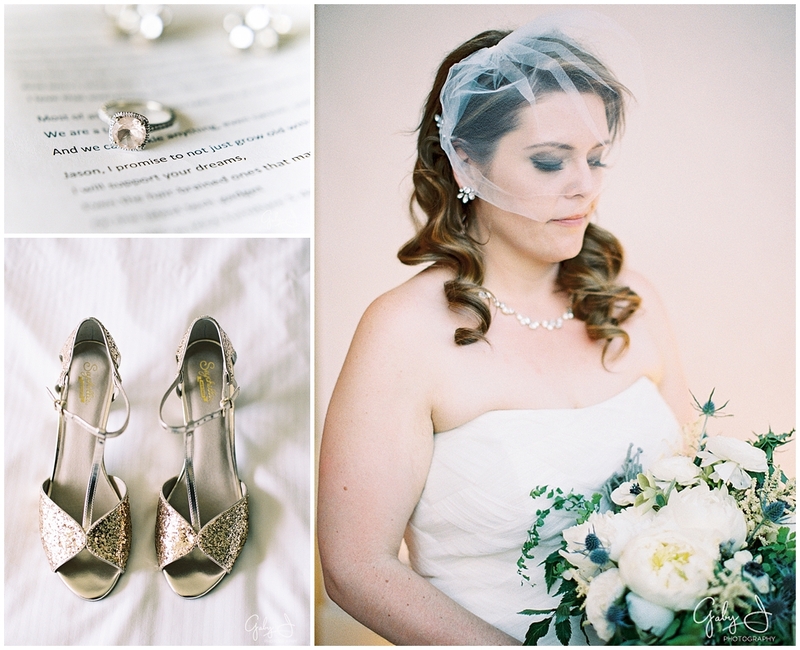 Thank you Gaby J for capturing these details and moments Angharad and Jason will share with their next generation. Angharad and Jason, like all of my couples, have a special place in my heart and will continue to be my dear friends. Scheme Events, Henderson and Las Vegas wedding planner, has been selected for the 2016 Best of Henderson Award in the Wedding Planner category by the Henderson Award Program! Yay! Each year, the Henderson Award Program identifies companies that they believe have achieved exceptional marketing success in their local community and business category. These are local companies that enhance the positive image of small business through service to their customers and our community. These exceptional companies help make the Henderson area a great place to live, work and play. Various sources of information were gathered and analyzed to choose the winners in each category. The 2016 Henderson Award Program focuses on quality, not quantity. Winners are determined based on the information gathered both internally by the Henderson Award Program and data provided by third parties. The Henderson Award Program is an annual awards program honoring the achievements and accomplishments of local businesses throughout the Henderson area. Recognition is given to those companies that have shown the ability to use their best practices and implemented programs to generate competitive advantages and long-term value. The Henderson Award Program was established to recognize the best of local businesses in our community. The organization works exclusively with local business owners, trade groups, professional associations and other business advertising and marketing groups. The mission is to recognize the small business community’s contributions to the U.S. economy.